Normally I'm the kind of person who, if I don't have anything positive to say about a game, just doesn't say anything. It's not really worth my time to write about a game I don't care about, right? 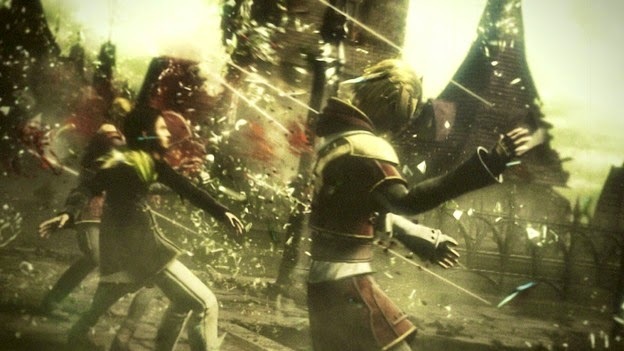 But Final Fantasy Type-0 is terrible, and I really feel it's only fair to let you know. This game was actually so bad, I had to wait a day to write about it, because yesterday afternoon I actually wanted to title this post "Type 0: a crappy game from crappy people who want you to waste your money on crappy things". My grumpiness was compounded somewhat by the fact that all the big review sites like IGN and Gamespot are giving this game glowing reviews that it frankly doesn't deserve, which led to me wasting money. Okay, enough venting, let me get into this. The game starts out with a cinematic that was probably only 15 to 20 minutes long, but felt like 3 hours. It was atrocious, disjointed, and fully 3/4 of the cinematic is spent on the tragic death of a character I can only assume you're supposed to care about, because you have absolutely no idea who he is. The graphics look to be polished versions of something you might expect to see on a hand-held device that's a generation or two out of date (because they are), which isn't too terrible, except in a few instances where you've got characters with highly detailed faces and wafting individual strands of hair who still have blocky shovel hands reminiscent of World of Warcraft characters prior to the Warlords of Draenor update. Apparently, the game is about 4 countries (that maybe have crystals?) that are represented by signature beasts: a white tiger, an azure dragon, a red phoenix, and a black tortoise. Fans of the franchise will recognize the references to (and overt appearances of) staples such as the Bahamut and Phoenix eidolons. The country with the tigers has magitek machines, and apparently they go to war against the country with the phoenix, which for reasons inadequately explained at this point, leads them to attack the stronghold of the country with the azure dragon. You're dropped into this war as three kids who just saw another kid (presumably one of their number based on the uniform and pretty much nothing else) die after struggling to find them (with no other apparent purpose) and apparently being too wounded to be healed by magic despite the fact that it takes him fully ten freaking minutes of cinematics to finally kick the bucket, at which point his chocobo (big two-legged riding bird, staple of the franchise), who's seemed dead for about eight of those ten minutes, suddenly comes back to life just long enough to give a mournful cry in a blatantly manipulative attempt to evoke an emotion the game hasn't earned. Then you get to spend about an hour and some change running through the city being subjected to some of the most boring and uninspired combat and maps you've seen in the last decade. The combat itself is brutally disappointing, reminiscent of the repetitive slogs seen in games like Devil May Cry where you hack and slash your way through dozens of faceless mooks over and over, without the inspired combo systems, unique maps, and flashy design that made that game a success. You get to control three (of an eventual fourteen) characters during this section, a character who uses magical cards to attack and perform other maneuvers (an almost successful call-back to fan-favorites of the franchise like Setzer in Final Fantasy III / VI), one who uses a spear and a jump attack (the "dragoon"), and a character who fights with a chinese longsword. Each character has all of four combat options available at this point, a standard attack, their special trick (card shuffling, jumping, and an AoE aura effect), one spell of a given element, and their defensive option. The combat has been compared to Crisis Core by several sites, but I really feel that does a disservice to Crisis Core, which had a robust combat interface that flowed seamlessly between the combat and exploration phases and utilized a highly customizable materia system that was actually pretty advanced for its time. I feel like I have to find some redeeming quality in the game at this point... Okay, there's two things. The first, is that the cinematics, while climactically disjointed and painfully, brutally boring, go to places that are out of the norm for the franchise, in a good way. You'll see Square-Enix referring to this game as a "more mature" entry. While the actual story-line is about as mature as a twelve year writing his first piece of fan fiction, what this is really referencing is the fact that in this war-time environment, we actually see spurts of blood when someone is shot or stabbed, soldiers ruthlessly gunning down or bayoneting enemy wizards and civilians, etc. If some real character and story development had been married to a cohesive plotline and a modern combat interface, this could have been an amazing step for the Final Fantasy franchise, whose original fans are now at an age where they have kids, or even grandkids, of their own. The second redeeming quality is that the game comes with a playable demo of Final Fantasy XV, an actual next-gen game set in the same world. Final Fantasy XV seems to be set to offer many of the things this game lacks: strong character development, a cohesive story, true next-gen graphics, and a robust combat system. While obviously still in the developmental stage, this fledgling game helped to restore some of the faith and hope that the actual game it was packaged with sucked out of me like some kind of vampiric leech that feeds on joy and nostalgia. Unfortunately, at the end of the day Type-0 isn't really a game; it's an advertisement for the actual game, that they expect you to pay $60 for. It occurs to me that there is one more thing I liked about this game; the combat, while painfully boring and simplistic, is at least geared to a level where I'm actually able to complete a given battle in the amount of time a real person has to spend playing a game. One of the recent trends in FF games where I basically program my party to play itself and then go eat a sandwich is largely absent here, and I really appreciate that. If we gave stars on this site, it might get one just for that.